Novel drug combinations that are designed to address tumor heterogeneity are urgently needed. In an Advance Online Publication in Nature Medicine, a group led by Paul Parren at Genmab and Daniel Peeper at the Netherlands Cancer Institute describe the generation, and demonstrate the potential, of a novel AXL-targeting antibody drug conjugate (ADC), AXL-107-MMAE. The paper by Boshuizen et al. can be found here. The new drug consists of a human antibody against the tumor marker AXL linked to the tubulin-disrupting agent MMAE. AXL-107-MMAE was effective against AXL-positive melanoma, lung, pancreas and cervical cancers in in vitro and in vivo models. 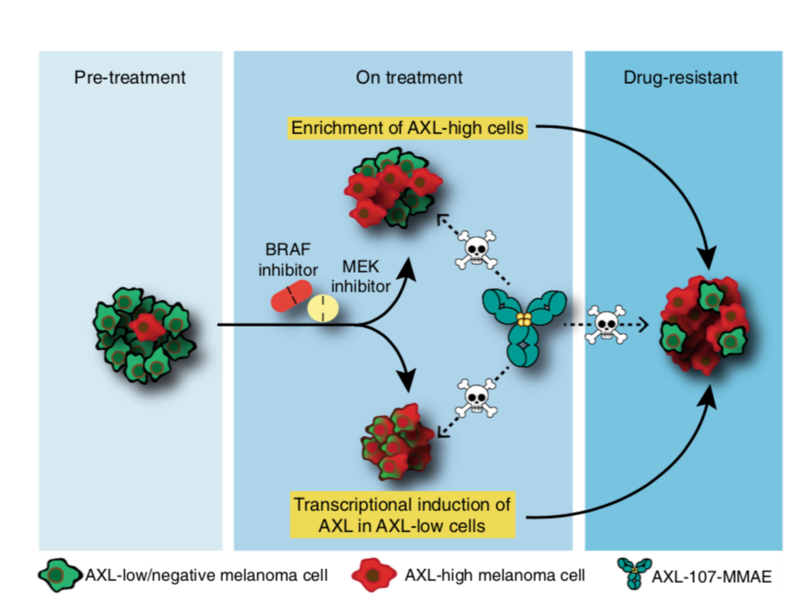 Peeper and colleagues discovered that drug-resistant clones that escape contemporary BRAF/MEK inhibitor therapy in melanoma may pre-exist and that these clones often express AXL. Heterogeneous tumors may therefore contain both: drug-sensitive AXL-low cells and drug-resistant cells with high AXL expression. Experiments by the talented graduate student Julia Boshuizen demonstrated that combining AXL-107-MMAE with BRAF/MEK inhibitors provided strong benefit by targeting these two separate tumor cell populations with a distinct drug-resistance profile (see Figure). The ADC called AXL-107-MMAE is being developed as HuMax-AXL-ADC by Genmab and a clinical study in patients with ovarian, cervical, endometrial, NSCLC, thyroid Cancer and melanoma is currently underway NCT02988817. The International Nonproprietary Name (INN) proposed by the World Health Organization is enapotamab vedotin. The study represents an outstanding example of how basic research can be rapidly translated to novel therapeutic insights in a successful Academia – Industry collaboration. Figure: Melanomas often display intratumor heterogeneity consisting of a low frequency of AXL-high multiple drug-resistant tumor cells in a large pool of AXL-low cells that respond well to BRAF/MEK inhibitors. Treatment with BRAF/MEK inhibitors alone leads to enrichment of AXL-high cells next to the transcriptional activation of AXL in AXL-low cells. AXL-high melanoma cells were shown to be sensitive to AXL-107-MMAE. Concomitant use of BRAF/MEK inhibitors and AXL-107-MMAE represents a promising strategy to increase tumor response and combat drug resistance.